A friend of mine recently lost a parent. Another is going through a divorce. One I know is spending the holidays alone. Another is working to avoid such a fate. I know some who struggle with depression during seasons that scream, “BE HAPPY!” I know others who close their eyes, hold their breath, and wait for it all to be over. I was reminded the other day of a Christmas that brought the deepest kind of sadness to me, something that may have been even harder to take given how much I love the season. The semester was coming to a close. I was finishing up finals and in only a few days would go home; home to a house that I’d grown up in and where I’d spent every Christmas morning of my life that I could remember. I was set to go home to something that I’d always looked forward to; a time and a place where every tradition was expected, followed, and enjoyed. Until now. I wondered if there would be a tree. I knew that there would be no special presents, the perfect kind bought months before when they’d been spotted at a store and purchased with love. I didn’t know if I’d have any presents, or at least any surprises. 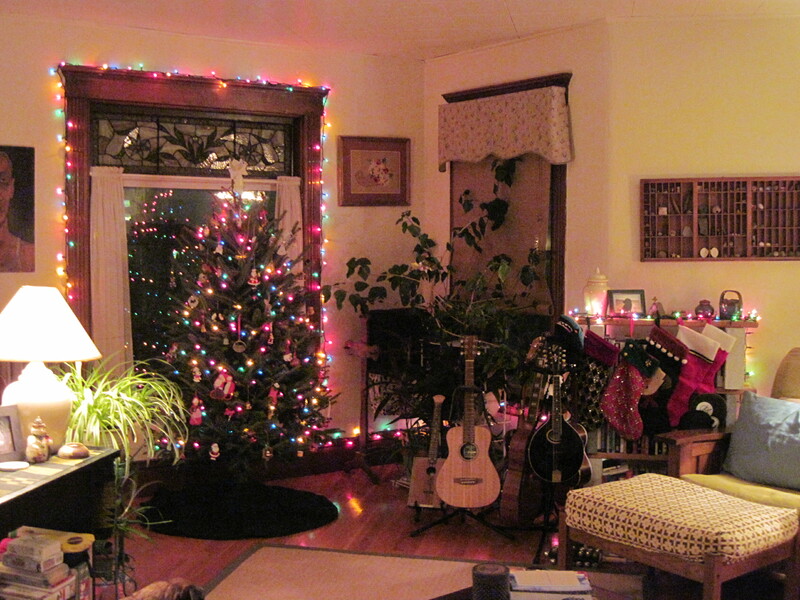 I knew there’d be no stockings hung, no candles in the windows, no smells of cider and cinnamon from the kitchen. I imagined there would be church on Christmas Eve, but I didn’t want to go. It wouldn’t be the same. Everyone would notice. As I went through the motions of studying and finishing papers, I also worked my shifts in the dining hall, assisting the cooks. This was back before feeding people was deemed an appropriate activity to outsource; back when a university hired adults to cook meals and students to help them, to serve others on the lines, to work the dish line, to scrub pots and pans, to swipe IDs. I worked in the dining hall throughout my years in college, finding it both a great source of beer money and one of the most fun jobs I have ever had (still, to this day). I worked as a Cook’s Aid (a position you had to be promoted to, mind you) alongside a couple of older guys, retired cooks from the Navy; two black women who reminded you of characters out of good Southern writing, strong and opinionated and wise, and who you minded no matter what; several women who had cooked in large quantity for most, if not all, of their working lives; Mary, who ran the ship and served as a surrogate mother to the students who worked for her, always firm and caring; and Robin. Robin was younger than any of the other adults, yet older than any of us students. She was just the right age, compared to us, to be both hip and authoritative. I’d come to love all of these adults very much, especially over the past year as they each, in their own way, looked after me, making sure I was okay. Rarely did anyone ever ask me outright, “Are you okay?” but I could feel concern in the looks they gave me from time to time, the extra hug I’d receive at the end of a shift. I knew they cared, but it wasn’t until this December came around and the looming sadness prevailed that I learned how much. I was cleaning up at the end of a dinner shift, wiping out the pass-throughs, the heated sections between the kitchen and each serving line where we placed pans of food to replenish the lines. I was using the Lime-Away to brighten up the stainless steel, the hard brushes to make things shine. I closed the door, like an oven “thwump”, and turned to go towards the bulletin board, to see the schedule and punch out, when I ran into Robin. She had in her hands a small Christmas tree, about 18″ tall, fully decorated with lights and red ball ornaments. She had tears in her eyes as she held it out to me. “I couldn’t stand the thought that you might not have a tree,” she said. I had tears in my eyes now, too. She gave me a hug and I cried harder than I wanted to. I could see the other cooks and a couple of my fellow student workers out of the corner of my eye. Even the old sailors’ eyes were moist. I took the tree back to my room in the sorority house. A few days later, I packed my suitcase and went home. There wasn’t yet a tree, but my dad and I did go get one together. He didn’t buy many any surprises, but took me shopping and told me to pick out a few things that I wanted or needed. We ate a Christmas Eve supper of spaghetti at the Sabarro in the mall; a far cry from the dining room table set with candles and the best china and the Waterford crystal glasses that only came out of the hutch this one night each year. We got dressed up and went to church for the candlelight service. People asked about school and gave me hugs. We drove home and then my dad left to go over to a friend’s house, leaving me all alone on the evening Santa comes to town. I’ve long ago forgiven my father for this act, but have to admit I’ve never forgotten. But I’ve also never forgotten that small tree, that gift given “just in case”. It was maybe the kindest and most thoughtful gift I’ll ever be given. In those times when we’re really sad, when our hearts are broken and hope is gone, what can be better than the gift of thoughtfulness and care, of something to show love just in case we need it? Because we always do. Thank you, Robin, wherever you are. This entry was posted on Friday, December 23rd, 2011 at 12:28 PM and is filed under daily muse. You can follow any responses to this entry through the RSS 2.0 feed. You can leave a response, or trackback from your own site. Thank you, Sally! I’ll bet Robin made a lot of people’s lives better.